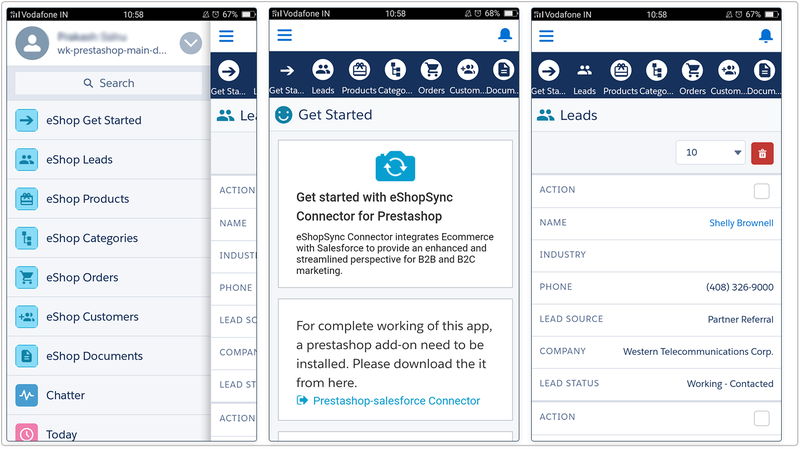 Prestashop Salesforce Connector:- This is an awesome module which synchronizes e-Commerce and CRM platform. Prestashop Salesforce Connector provides Real-time synchronization of Prestashop store to Salesforce platform. 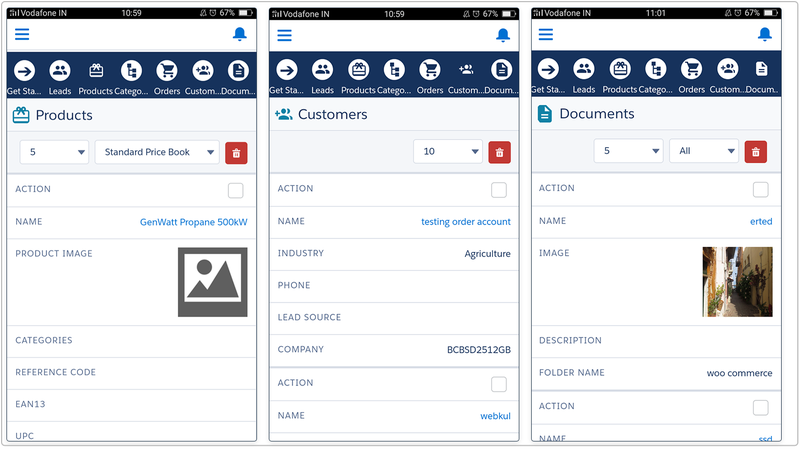 With the help of this module, admin can easily sync Contact Us as Leads, Customers, Categories, Products and Orders into Salesforce org which will help to increase their sales and customer services. 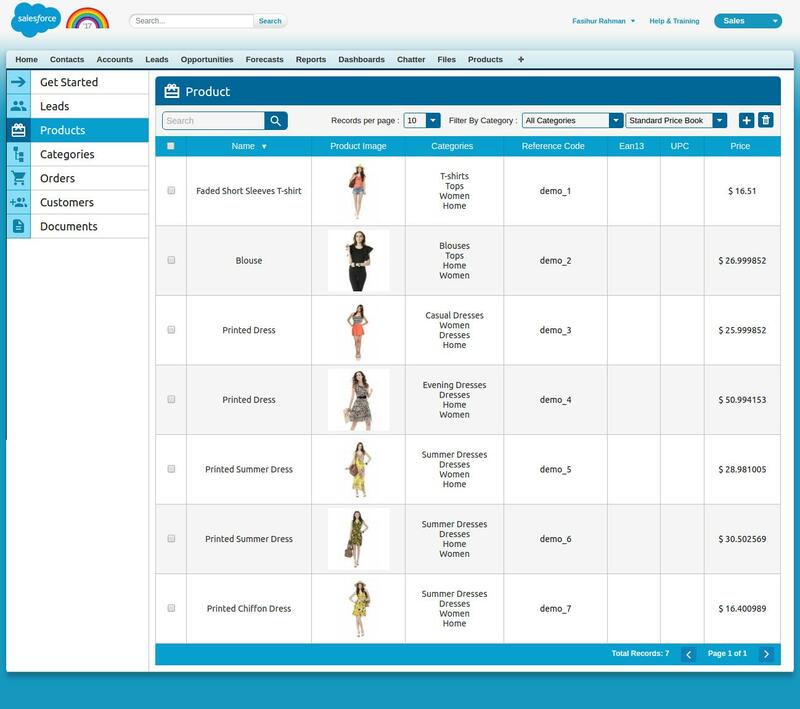 Admin can also synchronize Orders and Products from Salesforce to Prestashop store. IMPORTANT NOTE – As per the release of Prestashop V1.7 from 4th November 2016, we are working on making all the Marketplace add-ons and all the Prestashop modules to be compatible with the new version. So all the Prestashop module purchased after 4 November 2016, will get the updated version of the module once available. Can process bulk amount of data from Prestashop to Salesforce and vice-versa. Lightning features supported and provide you an interactive design with a brilliant user interface. Real-Time synchronization of Leads, Customers, Categories, and Orders. Admin can select a default folder for documents and default price book for product price. If you want to avail Salesforce Lightning expereince, you need to register your domain first. 1. Hover over Modules and Services | Click Modules and Services | Add a new module as displyed in the screenshot. 2. Choose the Prestashop Connector Zip file and upload it. 3. Click ” Install” to start the installation process of Prestashop Salesforce Connector as shown below. 4. Once it is installed, you will get Salesforce panel. Hover over Salesforce | Click Configuration to setup and configure the connector. 5. Choose WSDL file from your system location and then click Upload. 6. Under Settings section, choose the preferred option for Currency, Language, Document folder to store images of Products and categories and the Price book available at Salesforce end apart from Standard one. Then, enable/disable real-time sync option for Leads/ Customers/ Categories/ Ordres and click Save. 7. You may find previous Contact Us responses and Sync to fetch the recent ones accordingly. This completes the configuration of Prestashop Salesforce Connector. Now, lets proceed to Synchronize data from Prestashop to Salesforce and vice-versa. 1. Sync Customers: Hover over Salesforce | Sync Customers | Sync Customers to Salesforce | Select list of Prestashop Customers | Click Start Adding Customers to Salesforce. Refresh the page to get the list of Synced customers. 2. Sync Categories: Hover over Salesforce | Sync Categories | Click Sync Categories to Salesforce | Click Start adding Categories to Salesforce. Refresh the page to get the details list of Synced categories. Refresh the page to get the list of Synced Products. Refresh the page to get the list of Synced Orders. 5. Map Order Details: Hover over Salesforce | Click Map Order Details to choose the default Shiping and payment method. Also, to add/delete Order Status fields mapping of Prestashop and salesforce end. 6. Lead Status Mapping: Hover over Salesforce | Click Map Lead Status to change the mapping status of Prestashop Contact Us and Salesforce Lead. 7. Hover over Salesforce | Click on Sync Leads, all the Contact us responses will be automatically displayed under this section if you have enabled real-time synchronization of Leads. From App Menu, Select eShopSync from the drop down. Products & Categories Images synced in the Documents section. 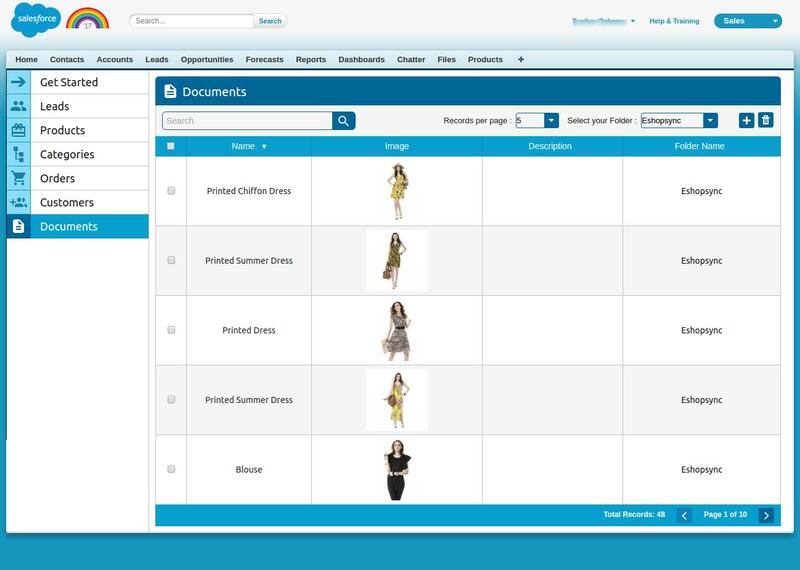 From Setup | in the Quick Find, search for Salesforce1 Navigation. Select all the eShopSync related tabs in the Available list and click Add to move them into the Selected list, then click Save. Q: What is the best way to test purchased connector file? 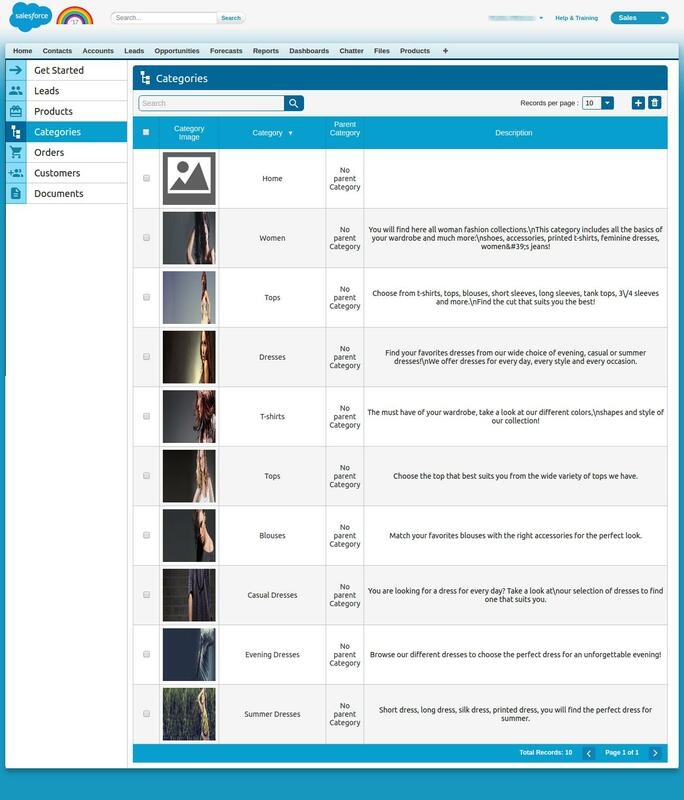 A: Data integrity is the main area of concern, we would recommend to install and test the connector sync features in Development site first by establishing the connection with Salesforce Sandbox. Upon successful testing, you may proceed to install the connector in Live site and Salesforce Production environment. Q: Which Salesforce editions Prestashop Salesforce Connector is compatible with? Note: For Salesforce Professional Edition, you need to get API enabled Org to avail connector Sync features. Q: What are the benefits of purchasing the connector along with Installation fees? A: Purchasing connector along with Installation fees bring you into a comfort zone where you just need to share required details to initiate the installation process. Our concerned team will effectively proceed with the installation process as soon we get complete details. Your trust and satisfaction is highly important to us so your data will be completely secured. Q: What will be covered under Installation fees? A: We will install and setup Connector at Prestashop end and get things ready to go situation for you. Installation of eShopSync For Prestashop as well, in case it is not installed at Salesforce end. We will sync a test record on each object to make sure that synchronization is working fine. Further, you may proceed with synchronization on your own. Q: What are the required details mandatory to share for Installation procedure? Would be preferable to install in Development site first in connection with Salesforce Sandbox, so create a Dev site and share the details accordingly. Prestashop Admin URL of the concerned site with login credentials. Salesforce login credentials and Security Token. SFTP/FTP Details such as Host Name, Port, User, and Password. NOTE: Mandatory to share SFTP/FTP details and all of the concerned site such as Host Name, Port, User, and Password if we experience any issue while connector installation due to any plugin confliction. Q: What are the conditions to pay Installation fees? A: If you are stuck and having trouble while proceeding with configuration then you need to pay Installation fees along with required details to install and setup the connector properly. NOTE: We have already provided help links and video tutorials to install and setup the connector. Q: When you can avail benefits of free support? A: Free support comes in picture once connector is installed and configured properly. If there is any issue while connector installation then it will fall under Installation process and will be treated as per Installation procedure. In case, you have not paid the installation fees and want support to install and configure the connector then you need to pay the installation fees and must share the required details to initiate Connector installation procedure. Q: What will be covered under Free 3 months of support availed with connector purchase? A: Post successful connector installation and configuration, if you are experiencing any issue while data synchronization that would fall under free support. You may find steps to resolve the issue under Frequently Asked Questions section as per error received. Else, you may create ticket on the link mentioned under Support section with steps to reproduce and provide all required login details. Q: What are the details mandatory to be shared to debug the issue? SFTP/FTP Details such as Host Name, Port, User name, Password. NOTE: Mandatory to share SFTP/FTP details and all of the concerned site such as Host Name, Port, User, and Password if we require while investigation. Q: What if you can’t share SFTP/FTP details or Login credentials of Prestashop and Salesforce due to privacy/security concern? A: Your data is highly secured with us and it is mandatory to share SFTP/FTP details and login credentials of Prestashop and Salesforce while investigation on any issue. Without having complete details, we can’t proceed any further. Q: Can you provide support on screen sharing sessions via any medium like Team Viewer/ GoToMeeting/ etc? A: No, we don’t provide any support on any of screen sharing sessions like Team Viewer/GoToMeeting/etc. Hence, it is mandatory to share complete details to provide seamless support. Q: What if you can’t share asked details on the support ticket to debug the issue and want a full refund? Q: What are the other options to get support if you have privacy concern sharing Live Site details? We will debug the issue and provide proper resolution in Development site. Upon successful testing, you can implement in Live site. Q: Error API_DISABLED_FOR_ORG: API is not enabled for this Organization or Partner. Note: For Professional Edition, you need to get API enabled Professional Edition to avail connector Sync features.